Although William Shatner has enjoyed a slightly more high profile musical career, it was actually Leonard Nimoy who struck musical gold first! Nimoy’s debut solo album Mr. Spock’s Music from Outer Space beat Shatner’s The Transformed Man by a year, in 1967. Both records are considered novelties, yet were followed up by even more albums. Shatner’s last, Ponder the Mystery (2013) featured Steve Vai and Rick Wakeman among many others. 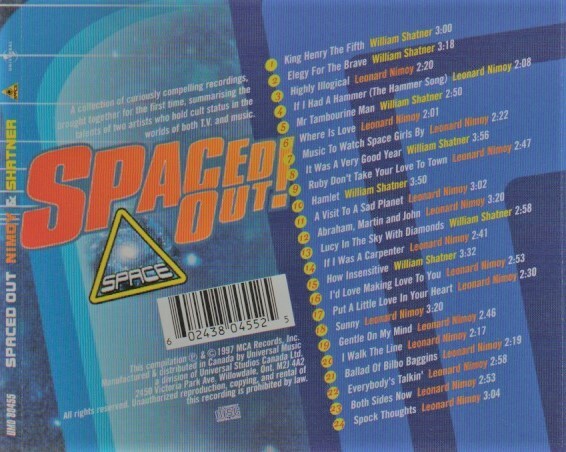 In 1997, the Space Channel assembled a fantastic greatest hits compilation of both Starfleet officers’ best. In 2017, Sir Aaron the Surprising sent me a sealed copy on a lark. It was meant to be a gag gift, but little did Aaron know I’d actually wanted this CD for a long time! After all, Shatner’s “Mr. Tambourine Man” has long been a hilariously bad favourite, and Nimoy’s “Ballad of Bilbo Baggins” truly is a hoot. Spaced Out! is a blast-off! Shatner’s material tends to the so-bad-it’s-funny side of things. His spoken-word vocals definitely re-imagine many classic songs, including “Lucy in the Sky With Diamonds”. Nimoy, meanwhile, uses his baritone to sing charming ditties like “I Walk the Line” and “If I Was a Carpenter”. In character as Spock, “Highly Illogical” is highly fun. Nimoy also had a knack for ballads, and perhaps just missed out on a career as a crooner? Less successful, Leonard goes country on “Ruby Don’t Take Your Love to Town”. He may have been able to play cowboys in movies, but playing one in music is much more difficult. 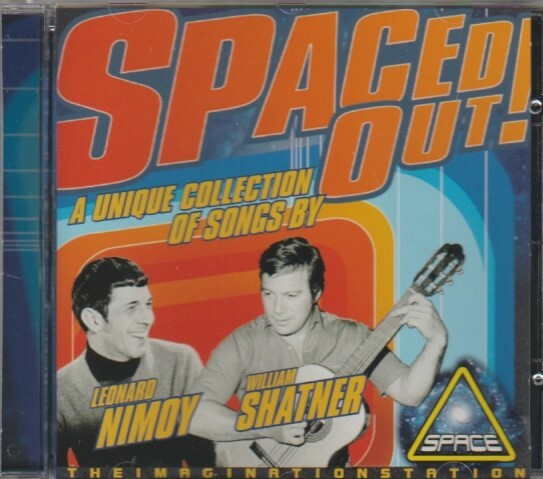 Nimoy’s music leaned more to the mainstream, while Shatner’s was experimental, bombastic beat poetry to music. Sometimes it works, sometimes it doesn’t. “It Was A Very Good Year” is highly questionable. Top Star Trek geek moment: Star Trek VI: The Undiscovered Country (1991) took its name from a line in Shakespear’s Hamlet (1602). In Shatner’s musical recording, “Hamlet”, he actually recites that line a couple decades before the movie was made. For fans, it’s ultimately cool to have a copy of Shatner reciting those lines. Let’s not deceive anyone, Spaced Out! is a novelty. You will chuckle and cringe more frequently than you will tap your toes to the music. Trekkies/Trekkers owe it to themselves to add this to the collection to expand their own universes. Even though Alice hadn’t produced anything as timeless as “School’s Out” during his 1980’s comeback, his profile rose greatly. Clean, sober and focused, Alice Cooper was very active in the last part of the decade. The same year as his final MCA album Raise Your Fist and Yell, he had memorable appearance at Wrestlemania III. In the corner of “good guy” Jake the Snake Roberts, Cooper had the honour of draping Roberts’ snake named Damien all over the Honky Tonk Man. After that, even my dad knew who Alice Cooper was. Cooper only had a two record deal with MCA: Constrictor was the first in ’86; also the first album in the comeback period. Having re-established himself with MCA, Alice then signed with Epic and had a genuine smash success with 1989’s Trash. With a dream team of writers and collaborators (including hitsmiths Desmond Child, Jon Bon Jovi, Richie Sambora, Steven Tyler, Joe Perry and many more), Alice scored a platinum album. 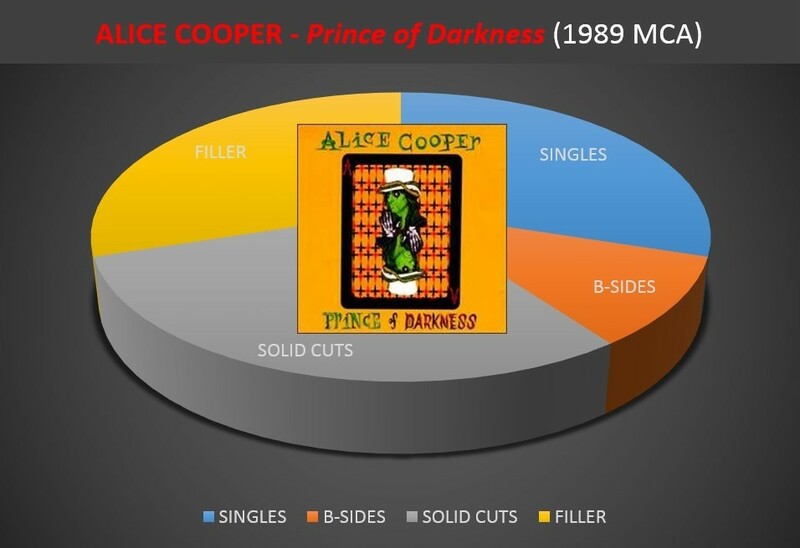 While Trash was still charting and producing singles, MCA put out a competing record: Prince of Darkness, a 10 track compilation of Cooper’s material for that label. Normally these kinds of releases are throw-aways, but Prince of Darkness is not and this review will tell you all about it. It is not unfair to state that Constrictor and Raise Your First were mixed affairs. You had to wade through a significant amount of filler to reach a disproportionate amount of modern classics. Prince of Darkness does a great service by collecting some of the best material together on one CD. It is well sequenced and even includes one rare track, an exclusive on compact disc. A grand opening is the dark and metallic “Prince of Darkness”, a theme song from a movie of the same name. This ominous and menacing track is one of the more memorable from this era, a heavy monument. It works amazingly well as an opening track, and “Roses on White Lace” follows by going faster and heavier. It was surprising to hear Alice creep this close to thrash metal, but what a track! A distorted vocal adds to the creep factor, making this one of the better samples of Cooper’s music during his “splatter horror” period. The 1986 single “Teenage Frankenstein” would be a must-own for any fan, and there it is in the #3 position. The big single from this era was “He’s Back (The Man Behind the Mask)”, a synthpop classic quite unlike the prior metal material. Right here is an easy and simple way to get this classic track, without having to buy Constrictor. Same with “Teenage Frankenstein”. A nice little track here is a 1976 live recording of “Billion Dollar Babies”! This was a B-side from the “He’s Back (The Man Behind the Mask)” single, but Prince of Darkness is the only CD with it. The track itself sounds heavily remixed (remixing is credited to Garth Richardson) but it is indeed a B-side that is easy to acquire by getting this disc. Ignore the annoying, screaming overdubbed crowd and just dig the vintage performance of one of Alice Cooper’s most timeless numbers. There are a few filler tracks on side two. “Lock Me Up” was fun, but not particularly memorable. Feel free to skip “Simple Disobedience” and “Thrill My Gorilla”, and go straight to “Life and Death of the Party”. Alice steps back into the shadows for a chilling horror number, mid-tempo and overcast. We are over and out with “Freedom”, another great single and dangerously close to thrash metal again. Prince of Darkness serves as the most effective way to get this one. That’s why I recommend Prince of Darkness to any fan who wants to get a slice of Alice in the late 80’s — but just a slice. The whole cake is for diehards. And lo! The beast named Alice reincarnated with a slab of wax, and they called it Constrictor. Slithering into the spotlight again was a triumph of will: Alice battled his demons (including the bottle), found some new young band members and started fresh on a new label. Though the music was merely OK, at least the man himself was doing just fine. As fans, I believe we genuinely wish our rock star heroes to be healthy and happy, so even if the music wasn’t the greatest, we could be glad that Alice was back. In the 70’s and early 80’s, Alice Cooper maintained a breakneck release schedule. 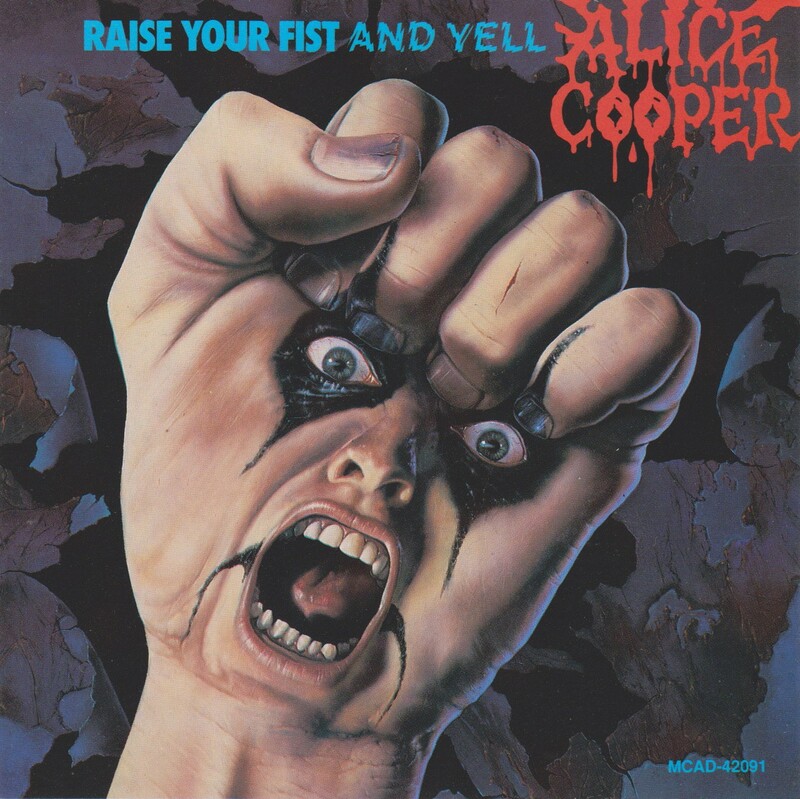 This slowed down a bit in the second phase of Cooper’s career, but he still managed to follow Constrictor a mere 12 months later with Raise Your Fist and Yell. I probably don’t need to tell you this, but look at the cover: certainly one of the worst to ever envelope a major label release. The guilty party is a fella named Jim Warren who must hate this cover as much as I do, because just look at it. It continued with the same shock-rock horror-splatter-movie theme, but turned up louder. Indeed, the lead single “Freedom” was the fastest most thrash-like track that Alice had yet performed. Censorship was a big target in Alice’s sights. “Freedom” was his ode to the PMRC: “You want to rule us with an iron hand, you change the lyrics and become big brother. This ain’t Russia! You ain’t my dad or mother.” Lemme tell you, when “Freedom” came out, the PMRC seemed a genuine threat. Dee Snider and Frank Zappa were testifying in front of the senate and stores were refusing to stock records. “Freedom” was an anthem we could all get behind. I don’t think anybody expected him to go so heavy! The video was interesting. Kane Roberts looks like he’s not sure if he’s at a bodybuilding competition or a music video shoot. There were some new guys in the band; that’s not Kip Winger on bass. On drums is Ken Mary, later of House of Lords. Most interesting is the guy dressed as a priest. You can see him up close during the lyric “Back off preacher I don’t care if it’s Sunday.” They looked like the biggest bunch of misfits assembled. Perhaps this is what Alice was going for? During this period, Alice was writing a few goofy rock songs. “Lock Me Up” is silly, but fun. It has a beat and you can headbang to it. “Take the Radio Back” sounds like a predecessor to “Hey Stoopid”, but not quite. “Give the radio back to the maniac!” sings Alice. Is he begging for airplay? It’s OK, but “Step on You” isn’t really. There are moments here and there, but these are mediocre songs. “Step on You” has an interesting atonal instrumental section but it doesn’t fit the song at all. “Not That Kind of Love” continues the heavy rock, but without hooks. Back to quality, “Prince of Darkness” is a heavy metal horror movie theme, from the film of the same name in which Alice had a cameo. Menacing and intense, this tune scores high marks on both the Cooper Scale of Rock Thrills and Chills, and the Cooper Scale of Heavy. Kane Roberts’ lead solo is pure pointless 80’s excess, but the song is what counts and it’s a good’un. The acoustic outro is perfection. “Time to Kill” keeps things above the bar. “Chop, Chop, Chop” does not. I know — you’re surprised, right? A song called “Chop, Chop, Chop” isn’t a diamond of the highest carat weight? Nor is it a turd, but certainly well below the watermark. It does serve as a lead-in to “Gail”, a high quality also-ran that recalls Alice in the year 1975. It is the only Kip Winger co-write on the album, and he’s responsible for its eerie keyboard vibe. Finally it’s “Roses on White Lace”, another borderline thrash metal track that absolutely rips every head in the room off. This track, firmly in the splatter film world, is an excellent example of Alice at his heaviest. For its entire duration, it’s breakneck speed. Bold song to end an album with. Post album, Kip Winger and keyboardist Paul Taylor bailed, and formed another band you might have heard of. Michael Wagener produced this record, and while heavy, the album is definitely lacking sonically in comparison to its contemporaries. All told there are four songs worth buying the album for: “Freedom”, “Prince of Darkness”, “Roses on White Lace”, and Gail. Three of those four songs can be found on the MCA compilation Prince of Darkness. So…your move.